Seamus Blackley, one of the driving forces behind the creation of the original Xbox, says the rise of Facebook and mobile gaming doesn't mean consoles are dead, it means they've won. There's a growing feeling in some quarters that the end of the console era is nigh. Online casual gaming, mobile devices and "the cloud," the thinking goes, signal doom for conventional couch-and-TV-dependent devices. But that's not the case, according to Blackley, who co-wrote the initial Xbox proposal for Microsoft and became one of the device's biggest boosters. What it really means, he told Edge, is that consoles have won. "All kinds of people are releasing consoles. They're called iPads, and Facebook. What's happened is not that the console business has died, it's that it has won," he said. "You can't release a device that's not a console now, and if you release one that can't be a good console, it will fail. It's just true." 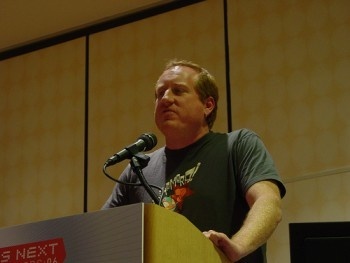 The denouement came with the rise of gaming on Apple hardware, Blackley said, despite the fact that Apple "hated" videogames. "The victory of games is utterly complete with Apple. It's a total victory," he said. "They tried real hard to make the iPad about word processing and music, and the audience just doesn't want it. It's beautiful. You don't need a games strategy anymore." "You need to have a strategy so that your platform isn't disadvantaged in playing games, because gaming is going to be the number one activity on any platform," he added. "The highest calling of any digital device is to play a game."